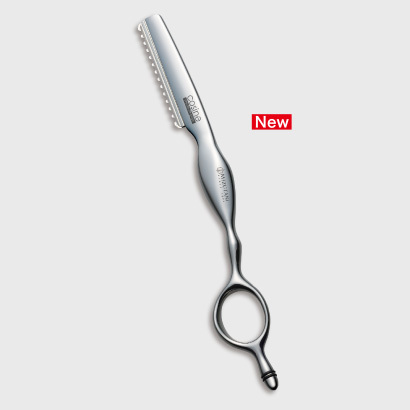 Mizutani Cosine Mirror Hair Razor has a deep shine and glassy feeling of the finish provide smooth handling. Faster, easier to use, and cleaner cuts than ever before. cosine makes it possible. Introducing the “cosine” next-generation razor, jointly-developed by Mizutani, and Mr. Katsuji Oono, a razor specialist. Faster, easier to use, and cleaner cuts than ever before. cosine makes it possible. Triple role >>> You can take care of all 3 elements length, structure, and texture with just one tool. Cut with just its weight >>> No damage to hair, because it cuts with just the weight of the body. Easy changing >>> The next-generation magnetic holding system enables quick blade changing. Four different grips >>> Easy to control “cut, volume, thin” only changing the razor holding position. Center of gravity in hand >>> When gripping it with the weight centered in your hand, it gives solid control for precise cutting. Principle of pendulum >>> Because we’ve purposefully moved the center of gravity outward, the razor swings smoothly back and forth like a pendulum. Nuance in hair ends >>> Gives a soft finishing touch to hair, for ends like the tip of a brush. Multi-talented >>> Can be used for a variety of effects, widening the breadth of techniques at your disposal. Even works for short >>> Gives a soft finish even for short haircuts and men’s hair.